WARNING: The content of this page (which gets updated only occasionally) may strike non-pet owners as overly sentimental. Our apologies. Top ~ Brief intros ~ Higher meaning? ~Jan. 30, 2001 3 Goldie; George not "ready"
Nov. 17, 2001 3? Princess; EGG BINDING! May 3, 2003 4 Princess; hasty, less window "flirting"
June 20, 2003 3 Princess; quarrelling and "kissing." George sings loud! Aug. 14, 2003 3 Princess; Tweety moved in. Oct. 6, 2003 3 Princess; George molting, not singing. Dec. 25, 2003 4 Princess; George resumed singing! Feb. 29, 2004 3 Princess; our trip to Peru! Mar. 23, 2004 4 Princess; George sings loud! Apr. 16, 2004 4 Princess; George sings loud! May 31, 2004 4 Princess; George sings loud! Nov. 25?, 2004 3* Princess; One egg broke. Hawks! Some singing. Dec. 30, 2004 3 Princess; George sings some, mischief "exploring." Feb. 5, 2005 3 Princess; trip to Costa Rica. Mar. 7, 2005 4 Princess; new nest in spider plant. ~ Apr. 3, 2005 3 Princess; George sings more. May 14, 2005 3 Princess (hurt leg); new nest on shelf. June 16, 2006 3 Princess, in 4 days. George sings loudly. Nov. 26, 2006 2 Princess; one broke. George more subdued. None of the eggs have hatched. 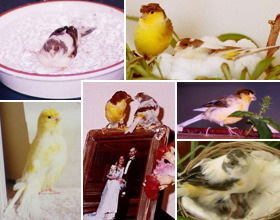 In almost every case, Goldie and Princess laid one egg each on the successive days following the first date listed above. A few times they skipped one or two days. Some of the numbers of eggs are guesstimates; "~" means approximate date. No automatic redirect? Please click HERE to go to the new Our Canaries blog page, as explained below. 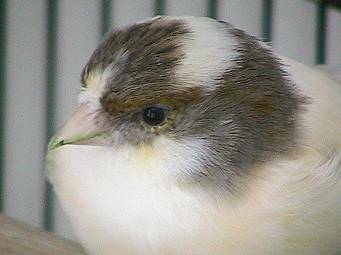 After two and a half weeks of brooding, Princess finally gave up on her one remaining egg today, and wasted no time in resuming her usual routine of flirting in the perch next to the window. Her excitement is no doubt related to the large number of "eligible" male goldfinches outside the window; they are quickly turning into their bright yellow breeding plumage. I finally managed to get a good closeup shot of Princess' face today; note that the tip of her beak is always green because of all the kale, spinach, mustard leaves, etc. she munches on. You can also see the black pupil and the dark brown iris, as well as the reflected window light. Compare it to the closeup of George I took last October. 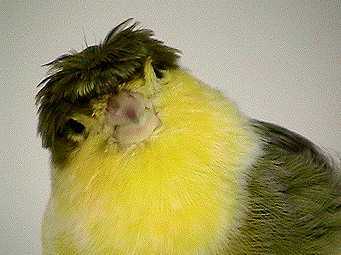 I also put some old photos of Goldie on the Canaries photo gallery page. Some of them are newly-enhanced photos I had posted years ago and later deleted. Adopted in June 2000 after she flew into a relative's apartment. Traveled with us to South Dakota September-October, 2000. Laid 16 eggs altogether. Died March 15, 2001 of an apparent infection. CLICK TO SEE PHOTO. Purchased January 20, 2001 (Inauguration Day, hence his name) in Stuarts Draft, VA. Aggressive, curious, superb singer, but more subdued during molting months. CLICK TO SEE PHOTO. Purchased April 2001 but suffered tragic leg injury on the day we bought her. Calm disposition but can be feisty around George, and often calls for him loudly when he's not in the same room. Total eggs laid: 151. CLICK TO SEE PHOTO. It is easy to anthropomorphize animal behavior and interpret mating rituals as though they signify romance. Whatever degree of consciousness birds may actually possess, there has to be SOME underlying parallels between the bonds of love that we human beings feel for each other and the obvious affection that bird pairs show to one another. Just as we birdwatchers get a glimpse of divine purpose in the midst of our seemingly chaotic, violent world when we watch wild birds go through their daily routines of looking for food and mating partners, so too can we see our own frail human passions and longings mirrored in the tiny eyes of our fine feathered companions who live with us at home. As you can see, caring for pet birds is quite an emotional roller coaster, somewhat like raising kids, I suppose, but obviously with much less commitment of time, energy, and money. I hope this page has awakened your spirits at least a little bit, as we really wish we could share the joys as well as the occasional sorrows that come with INDOOR birding. Any comments? Please contact us at: postmaster@andrewclem.com. Want to see more? Additional photos of Goldie, George, and Princess can be found on our Photo Index page.